This simple relish is elevated with the addition of Grand Marnier which enhances the fresh orange flavor. Plan to make this a several days ahead of time, it gets better with age. If you have any leftover try it with plain Greek yogurt or cottage cheese – so good. In the sink, put the cranberries in a large bowl and fill it with water. Remove all the soft or damaged cranberries and pour into a strainer. Wash the oranges, cut them into quarters and remove the seeds (do not peel). In a food processor, combine all the ingredients and pulse until the relish is uniform. Store in the refrigerator in a glass container. This entry was posted in Recipes and tagged cranberry, orange, relish, sauces. Bookmark the permalink. New twist with the grand marnier! 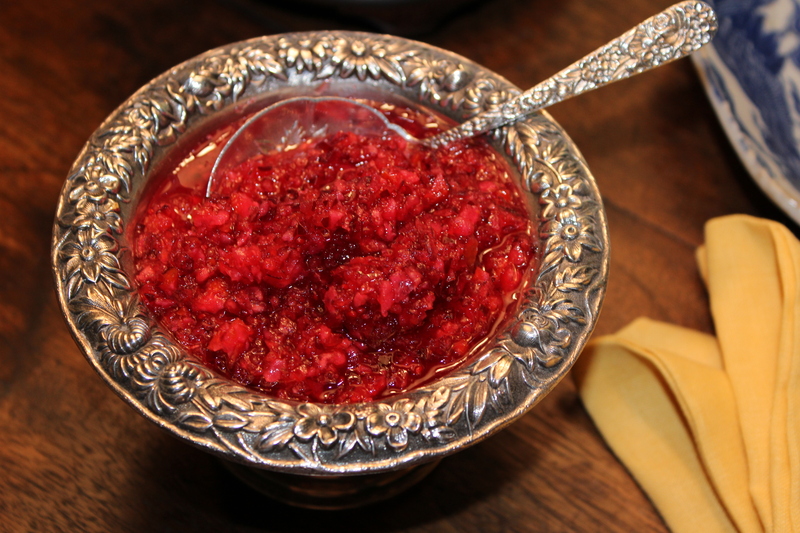 We make this relish every year, but cut the sugar to ½ cup. Hope your Fall is awesome and that the upcoming holidays wonderful!